A father who was a mob bookie in Chicago and a Mormon mother might have contributed to Warren Zevon developing into such a fascinating combination of wildly irreverent and deeply poignant songwriting. 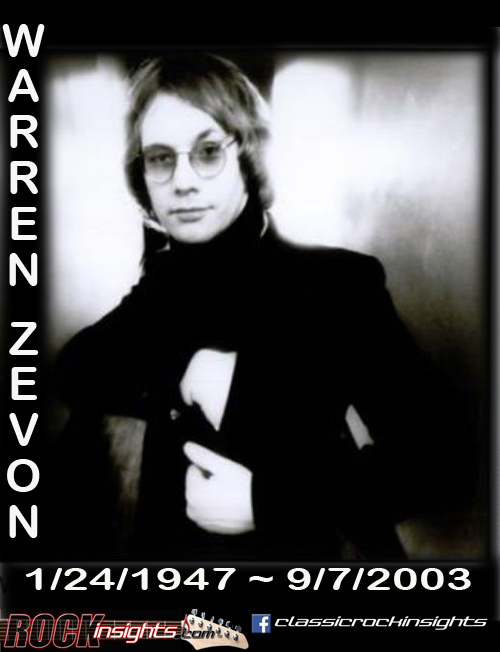 In his early teens, Zevon's family moved to California where Warren studied classical music, sometimes with the celebrated Igor Stravinsky. He bailed on high school after his parents divorced when he was 16 and headed east to tap into the New York City folk scene. He had more success as a writer than a performer, writing a couple of songs for the Turtles and landing a track on the 1969 movie Midnight Cowboy's soundtrack. His solo debut, Wanted Dead or Alive got released to little notice that year. He toured as keyboard player for the Everly Brothers. In the mid '70's Warren relocated to southern California and things started to fall into place for him. He got tight with Stevie Nicks and Lindsey Buckingham just as the couple was was getting into Fleetwood Mac and did some work with Jackson Browne. Zevon would enlist those three and, partly through their connections, Mick Fleetwood, John McVie, Eagles Don Henley, Glenn Frey, David Lindley, Linda Ronstadt, Bonnie Raitt and Carl Wilson of the Beach Boys to help him on his major label debut. Browne, who produced the self-titled 1976 release, also signed on to co-produce the follow-up, 1978's Excitable Boy, with Waddy Wachtel. The title track, Werewolves of London and Lawyers, Guns and Money all became big songs. He would write plenty of great songs from that point forward, but none would come close to gaining the recognition those did. In 2002, Zevon was diagnosed with a cancer associated with asbestos exposure. Deciding he wanted to record a final album, he declined treatments that would possibly have prolonged his live but would have made recording one too difficult. Long time musical friends Jackson Browne, Don Henley, Joe Walsh, Timothy B. Schmit, Bruce Springsteen, Tom Petty and Emmylou Harris helped him do it. The Wind was released just under two weeks before Warren died in 2003.